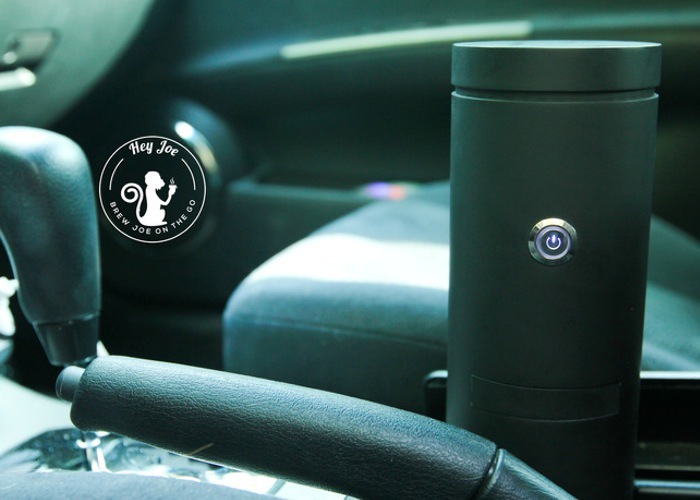 Coffee drinkers that would like to enjoy a brew on the move, might be interested in this innovative smart coffee mug called Hey Joe. That has been designed to enable users to easily brew their favourite blend of coffee to their preferred temperature at any time day or night, without the need for a large desktop coffee machine. The Hey Joe smart coffee mug has been designed as a travel sized coffee mug that includes the brewing mechanism and temperature regulator to make sure you will never be without your favourite coffee on the move ever again. “Whether you’re a working professional or a student, there is nothing worse than taking a sip from your travel thermos, only to find the coffee is lukewarm or cold. No problem, just push the button on the Hey Joe Coffee mug and it will warm your coffee up in a matter of minutes! The Hey Joe smart coffee mug project is currently over on the Kickstarter crowd funding website looking to raise enough pledges to make the jump to production. So if you think Hey Joe smart coffee mug is something your life could benefit from, visit the Kickstarter website now to make a pledge and help the Hey Joe mug make the jump from concept drawings into reality.